Home Energy Magazine :: If You Build It, They Will Come. . . But Will They Buy? With few banks loaning money and a more competitive market, how can high-performance new-home builders market their homes? Here are some success stories. A version of this article appears in the May/June 2011 issue of Home Energy Magazine. Many home builders are experiencing a much slower construction schedule than that of five years ago. So with fewer mortgages being approved, many builders—if they are still in business—have time on their hands and are actually interested in learning what building scientists have been preaching all along. They are learning that high-performance homes don’t have to cost more to build, compared to a code-minimum homes, given the fact that a high performance homes’ monthly cost of ownership is less than that of a code-minimum home. They are learning that not only do they cost less to operate, these homes provide a better indoor environment. They are also learning that consumers want high-performance homes. So in a Field of Dreams, with few banks loaning money, and a more competitive market, how can high-performance builders market their homes? This article discusses several Building America builders in Florida that are committed to constructing their homes to a HERS index of less than 60 and to meeting the Builders Challenge Quality Criteria (see “Builders Meeting the Challenge”). However, two of these builders (let’s call them Builder A and Builder B) are more successful than others at selling homes in a market that has been depressed for nearly five years. Builder A has been outselling the competition by nearly two to one—and in the same subdivision! The successful builders market their homes by creating an emotional appeal to prospective home buyers. This appeal is based on positive monthly cash flow and low energy bills. When they make clear the other benefits, such as greater comfort and improved indoor air quality (IAQ), these successful builders can position their homes as a premium product that justifies a premium price. The successful and not-so-successful builders in Florida are learning that energy-efficient measures alone do not attract new-home buyers in an economy where retrofits and renovations are now booming. One stagnant builder, Builder C, does build high-quality, high-performance homes. So why isn’t Builder C experiencing the same success as Builder A and Builder B? Although working with a knowledgeable building scientist is a key element to building a successful marketing plan, which includes third-party certifications, making these claims is not enough to get people to buy today. Marketing is imperative, but builders make a mistake when they assume that every potential home buyer has the same beliefs and interests. Whether people buy a product that has a premium price tag because they see it as a status symbol, or whether they buy it for purely emotional reasons—such as that heart-fluttering feeling when we watch beautiful people drive elegant cars down ribbons of picturesque, coastal highways and we picture ourselves behind the wheel—they must first be convinced that the product is worth the investment. And whether or not they will be convinced depends largely on how the message is delivered. Let’s look at how Builder A delivers that message. This company has been building Builders Challenge-compliant homes for more than two years. They are one of the pioneer builders inducted into the program. Builder A identifies its target client; it does not make the mistake of being all things to all consumers. It has aimed its marketing to hit home with that target client and has tailored its advertising with a specific message: energy efficiency. However, the key message is not just that energy efficiency provides a benefit; it is that the benefit is one with emotional appeal. Saving money on your electric bill will leave you with money to spend vacationing with your kids, or even without them (see Figures 1 and 2). Builder A also uses a powerful video within the Zero Energy Blog on its web site, complete with cute kids, bragging rights, one-liners, and captivating music. The pair of photos in Figure 3 depicts reduced electricity costs and amenities that are often the key selling features in new homes, such as granite countertops and high-end wooden cabinets. Another successful marketing practice is using creative names for features. Often we engineers need to spend a day with Realtors to understand that scientifically supported high-performance home lingo (albeit legitimate) is just not mainstream. The Building America program uses research results to justify best-practice building standards. The program wholeheartedly encourages and highly recommends a systems engineering approach. I use this phrase often in my presentations to colleagues, builders, and architects, but until recently I didn’t really look at the audience to see whether this approach was sinking in. It wasn’t. Fear tactics are also powerful marketing tools. Most Home Energy readers know now that high-performance windows reduce the solar degradation of furniture, carpeting, and so on, besides providing clear views and more comfortable and thermally efficient living spaces. You can highlight all these facts to the customer, though the fear of faded furniture may have the biggest impact. Marketing tactics can be technical or emotional (see Figure 4). In this ever more aggressive and litigious era of greenwashing and warranting performance promises, home builders are concerned about possible legal implications and expensive callbacks from their clients; and clients are very concerned about the health of their families. You need to stress that a well designed home provides high indoor air quality and healthy living. Building high performance homes reduces a builder’s liability exposure. One of Builder A’s most notable successes was virtually eliminating callbacks and complaints associated with mechanical systems. One of the builder’s biggest expenses before his involvement in the Building America program was callbacks due to the occurrence of hot and cold spots in houses caused by unbalanced air flows. We are living in an era in which smart phones dominate our everyday lives. Even my five-year-old daughter will often say, “Let’s Google on your phone for that,” or “Just text Daddy where we are.” And now there are mobile apps for almost everything you can think of. But even with the digital world at our fingertips, people still want to feel things and play with things. Ken Fonorow, energy and building science consultant to Builder A, says, “They won’t know if you don’t show them.” Builder A and Builder B both use the show-and-tell techniques to sell more homes. Granted, when potential buyers are touring a home, they want to see crown molding on eggshell finish, painted drywall, and granite countertops instead of continuously sprayed, formaldehyde-free, R-15 fiberglass insulation in 2 x 4 framing with ladder T walls and insulated headers. Yet both Builder A and Builder B use see-for-yourself mock-ups in their model homes and sales offices. They have gadgets and gizmos that offer salespeople the chance to educate and bond with the customer. They even have stuff for the customer to play with (see Figure 5). Building America is an industry-driven, private-public partnership research program sponsored by DOE and designed to accelerate the development and adoption of advanced building energy technologies in new and existing homes. 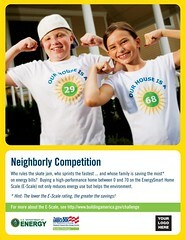 Builders Challenge is a program under Building America and a marketing tool for builders. It provides builders with a way to ensure that their homes are the most energy-efficient, durable, and safe homes available, with good IAQ, and built with environmental stewardship in mind. The program requires builders to use the Builders Challenge Quality Criteria (BCQC) Checklist. Once requirements are met, the builders are given an EnergySmart Home Scale (E-Scale) label to affix to the electrical panel of the home. The E-Scale is a credible label that demonstrates to a new or potential homeowner what the projected utility consumption will be for that home—much like a miles per gallon sticker that is affixed to new cars. The number on the E-Scale is the home’s HERS index. The HERS index is a scoring system established by RESNET. A home built to the specifications of the HERS reference home (based on the 2006 International Energy Conservation Code) scores a HERS index of 100, while a net zero energy home scores a HERS index of 0. The lower a home’s HERS index or E-Scale, the more energy efficient it is in comparison to the HERS reference home. 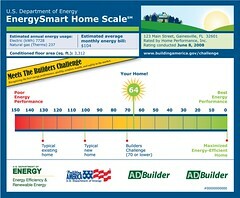 A 70 on the E-Scale indicates that a home is approximately 30% more energy efficient than a typical new home built to code. A 60 on the E-Scale would be 40% more energy efficient. To get people to come see the high-performance home you’ve built, you have to invest in marketing and advertising. The wise old saying is still true: You have to spend money to make money. Word of mouth is not good enough anymore, especially with more people communicating digitally and fewer people actually talking face to face. In the Facebook world we live in, where anyone can create any kind of page that shares information, the social media market is the avenue we use to get consumers to travel to us. Builder A and Builder B both spend significant marketing dollars to get their message across, using print advertising as well as online marketing. Builder A’s first net zero energy home sold two weeks after completion. Creative and targeted audience advertising was vital to its success (see Figure 6 and photo above). To achieve success, Builder A and Builder B also use incentives and effective branding. Builder A pays the homeowner’s electricity bills for a year—on all the homes it builds, not just the zero energy ones. Builder B has developed its own brand initiative, called SunSmart, which touts the advantages of making best use of sunshine and an energy-efficient home. The two strategies accompany the more-popular and well-marketed Energy Star certification program but offer an additional feature or value-added component. Both Builder A and Builder B have taken advantage of the EnergySmart Home Scale (E-Scale) and other marketing material, such logos, web banners, yard signs, press releases, and consumer and technical resources. One yard sign that displays the HERS index, or E-Scale, of the home is initiating a little friendly competition among new homeowners for bragging rights. The sign offers this company an opportunity to educate not just home buyers but their children as well. Does High Performance Really Matter? Has the construction industry begun to embrace and integrate green and energy-efficient features that can imply high performance? Or is it merely trying to increase sales by providing these features to customers who are asking for them? High-performance homes have transformed the market in new-home construction. Marketing strategies gave Builder A and Builder B the tools for success. Success in the home-building market is measured by home sales. Table 1 documents sales data for Builder A and a less-successful competitor. Both companies are located in Gainesville, Florida. Each company is building homes in a community with 275 lots. Builder A is a Building America partner; the competitor builds regionally code-minimum homes. All the homes are very similar in style, footprint, and so on, but Builder A builds homes with improved envelope insulation, including T-stud walls and insulated headers, with less than 3% duct leakage, and with right-sized HVAC equipment with air handler and ducts located in conditioned space. These are standard features, not upgrades. The result is a sales price that is 8% higher per square foot than the other builder’s sales price—and faster sales. This comparison suggests that higher-performance homes can transform the new-home construction market. However, without effective marketing, Builder A might not have been so successful. Builder A’s homes are in a community that is less than 2 miles from another Building America builder, Builder C. Builder C has employed all the same energy-efficient strategies, improved IAQ measures, and so on. However, Builder C has not experienced the same success as Builder A. The difference is that Builder C is not advertising, marketing, or expending adequate time, energy, and money to sell the value-added features of its homes. Builder C does have a model zero energy home, but it has very limited show-and-tell features and the sales staff are less involved in selling the energy efficiency features of its homes than Builder A’s staff. Finally, Builder C is not yet heavily invested in social media. The other Building America builder experiencing success (Builder B) is located in Melbourne, Florida. This company, like Builder A, attributes its increased sales to the value-added features of its homes. Builder B is considering plans to retrofit its older stock of homes to meet the Builders Challenge performance standard. Table 2 shows that this company sold fewer new homes between 2007 and 2008, when it was building code-minimum, standard homes. New-home sales increased by 92% between 2008 and 2009, when the company started to build to Builders Challenge performance standards. Builder B presold eight Builders Challenge homes in four months during 2010. As the construction industry starts to acknowledge that a home’s high-performance features set that home’s builder apart from the pack, more builders are voluntarily practicing the quantifiable performance strategies that the Building America Builders Challenge brand offers. So I’ll end this article with a challenge to builders. Go the distance and challenge your team and business model to include some measures that will provide a quantifiable benefit. If you build it right (and market it appropriately), they will come—and they just might buy it. How they will finance it is the subject of our next article in Home Energy. Stephanie Thomas-Rees is a research architect in the Buildings Research Division at the Florida Solar Energy Center (FSEC), where she has been involved with high-performance buildings research since 2001. Todd Louis is vice president of Tommy Williams Homes. Ken Fonorow is president of Florida HERO, has been involved in building science and energy conservation for over 30 years as an energy analyst, consultant, and problem solver, and is experienced in residential mechanical systems design and installation. Contact the author at sthomas@fsec.ucf.edu.